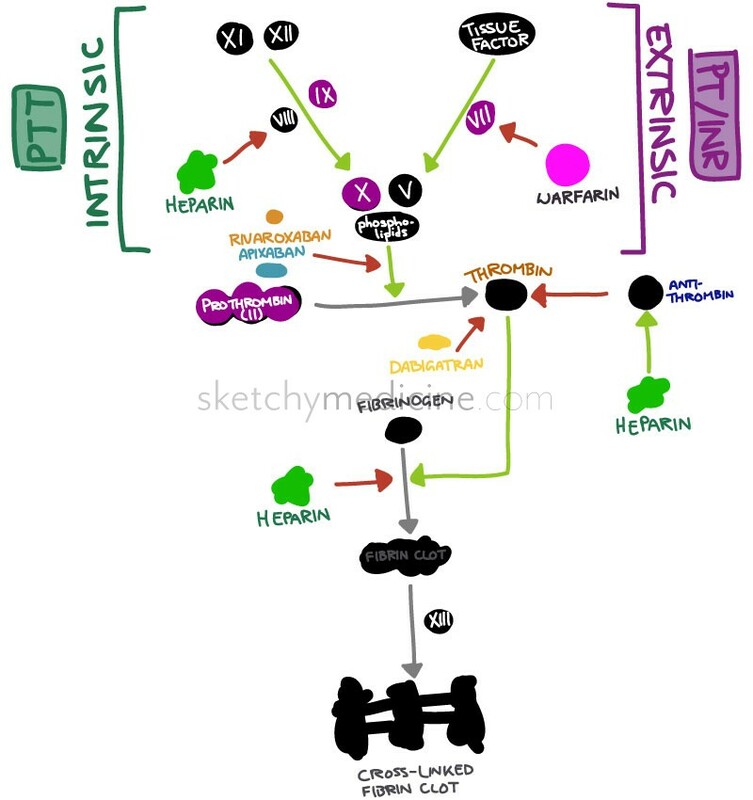 The clotting cascade was one of the first doodles posted on Sketchy Medicine, I’ve now updated it to include some of the Novel Oral Anticoagulants (NOACs): Dabigatran, Rivaroxaban and Apixiban. Only good for agents that aren’t highly protein bound (i.e. 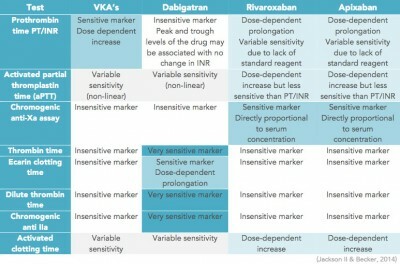 dabigatran). Jackson II LR & Becker RC. (2014). Novel oral anticoagulants: pharmacology, coagulation measures, and considerations for reversal. Journal of Thrombosis and Thrombolysis, 37(3), 380-391. Ufer M. (2010). Comparative efficacy and safety of the novel oral anticoagulants dabigatran, rivaroxaban and apixaban in preclinical and clinical development. Thrombosis and Haemostasis. 103: 572-585. Siegal DM. (2015). 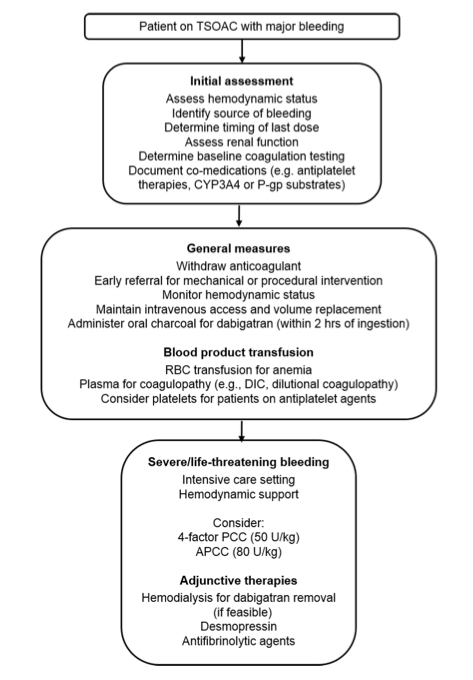 Managing target-specific oral anticoagulant associated bleeding including an update on pharmacological reversal agents. Journal of Thrombosis and Thrombolysis, 1-8. When you find someone without a pulse but then hook up the monitor and there is a rhythm, your first thought it probably “CRAP!” But as you start CPR, you need to be thinking about what caused it because not much will help the person except correcting the underlying problem. Cardiogenic – Poor cardiac function reduces forward blood flow. 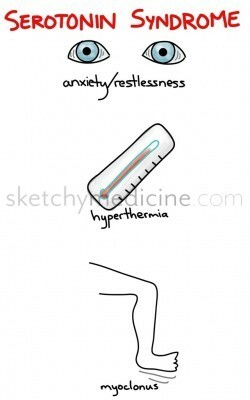 Hypovolemic – Loss of intravascular volume caused by: hemorrhage, dehydration, third space loss, vomiting, diarrhea. Obstructive – Impair cardiac filling due to external restriction. 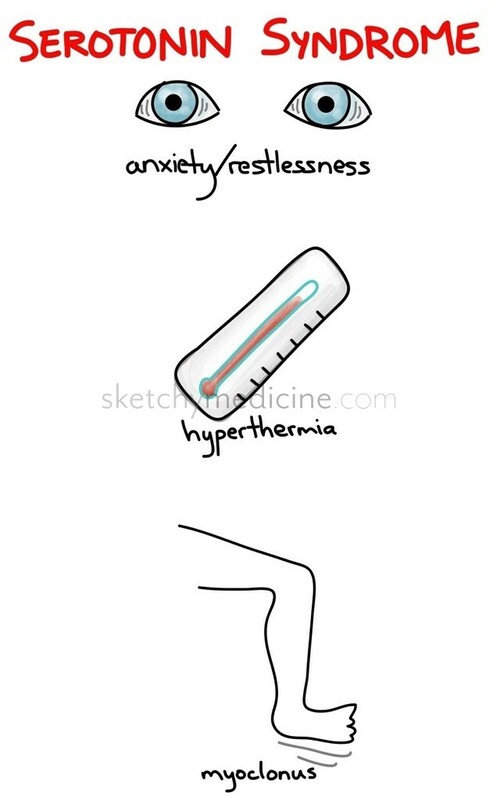 Caused by cardiac tamponade, tension pneumothorax, pulmonary embolus. Distributive – Primarily characterized by loss of peripheral vascular tone. Caused by septic, anaphylactic, adrenal insufficiency, neurogenic, liver failure. Effects: Causes vasoconstriction and increases cardiac output. Inotrope effect predominates at low doses (< 4.0 mcg/min). Disadvantages: Associated with lactic acidosis, hyperglycemia, pulmonary hypertension, tachyarrythmias, and compromised hepatosplanchnic perfusion. Use: First-line agent for cardiac arrest and anaphylaxis. Second-line agent for vasopressor and inotrope effects, when other agents have failed. Effects: Potent vasoconstrictor. Causes a minor increase in stroke volume and cardiac output. Disadvantages: May decrease renal blood flow and increase myocardial oxygen demand. Extravasation at site of intravenous administration may lead to tissue necrosis. Use: First line therapy for maintenance of blood pressure. Effects: Increases heart rate, cardiac output. 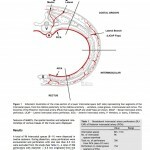 Bronchodilator. Some anti-emetic effects. Longer duration than epinephrine. Has indirect actions on adrenergic system. Use: Common vasopressor during anesthesia, but only a temporizing agent in acute shock. < 5 mcg/kg/min – Acts at dopamine receptors only, with mild inotrope effect. Vasodilatory effects purported to improve perfusion through renal and mesenteric vessels; however, there is no clear clinical benefit of dopamine on organ function. 5-10 mcg/kg/min – Predominantly β1 adrenergic effects. Increases cardiac contractility and heart rate. >10 mcg/kg/min – Predominately α1 effects, causing arterial vasoconstriction and increased blood pressure. Overall decrease in renal and splanchnic blood flow at this dose. Disadvantages: Has a high propensity for tachycardia and dysrythmias. Potential for prolactin suppression and immunosuppression. Use: First line vasopressor for shock, but may be associated with more adverse outcomes than norepinephrine. Effects: Racemic mixture. where the L-isomer acts at α1/β1 receptors and D-isomer acts at β1/β2 receptors. Increases cardiac output and decreases systemic/pulmonary cascular resistance. Can increase splanchnic blood flow and decrease endogenous glucose production. Disadvantages: May cause mismatch in myocardial oxygen delivery and requirement. Vasodilation undesirable in septic patients. 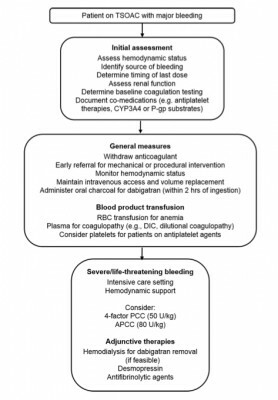 Use: A ‘gold standard‘ inotropic agent in cardiogenic shock with low output and increased afterload. In sepsis, vasodilatory effects should be counteracted by co-administration with norepinephrine. Effects: Acts at β2 and dopamine receptors. Causes vasodilation and decreased afterload. Has some positive inotrope effect. Bronchodilatory. Unlike dopamine, dopexamine is not associated with pituitary suppression. Disadvantages: Not widely accepted in practice. Use: Like dobutamine, useful for cardiogenic shock with decreased output and high afterload. Effects: Classic selective α1 agonist, causing vasoconstriction. Rapid onset and short duration. Disadvantages: Can reduce hepatosplanchnic perfusion. May cause significant reflex bradycardia. Use: Generally considered a temporary vasopressor until more definitive therapy is begun. Useful for vasdilated patients with adequate cardiac output, for whom other vasopressors present risk of tachyarrhythmias. Effects: Arousable sedation with preserved respiratory drive. Improved tissue perfusion and renal function. General sympathetic inhibition. Use: Not used in acute shock setting, but may be useful in later critical care setting. Effects: Acts on V1 receptors to cause vasoconstriction. Increases vasculature response to catecholamines. Disadvantages: May cause tachycardia and tachyarrythmias. Excessive vasoconstriction can impair oxygen delivery and and cause limb ischemia. Use: May be used to augment norepinephrine or other agents. Not typically used alone. Serotonin syndrome is a serious and life-threatening reaction caused by excess serotonin in the CNS.